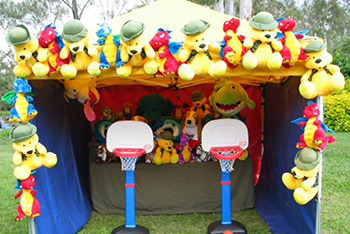 No carnival is complete without a 'Sideshow Alley' and we have a selection of terrific games to suit any size venue, indoors or out. 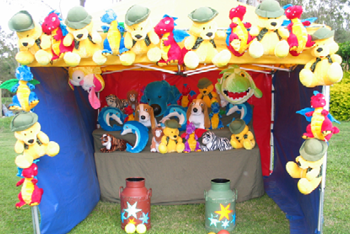 Games have additional various options available, such as prize racks, signs, tents, lighting, and so on. 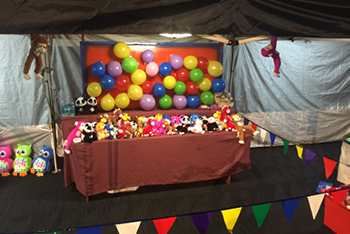 We have a large range of equipment for any corporate event, carnival theme, trade show or school fete. 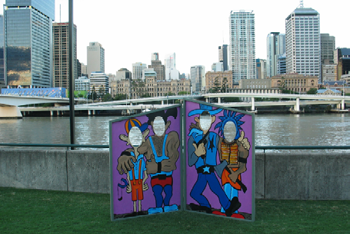 Call us now for any requirements in Brisbane, Ipswich, Toowoomba, Gold Coast or Sunshine Coast. 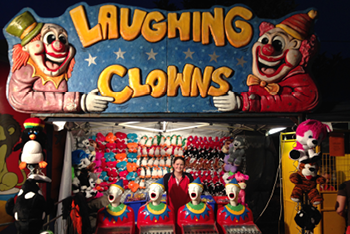 A traditional line of Laughing Clowns are a carnival favourite. This can be a set of four, three or one, beautifully presented clowns. They can be part of a shared profit scenario or hired with an operator for your event. 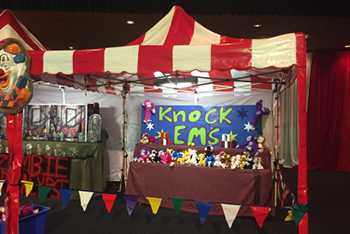 An outstanding trade show attraction. 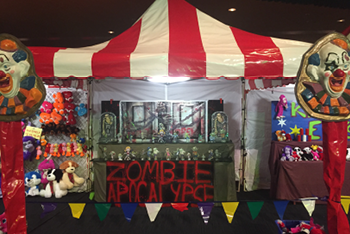 Can be used to substantially boost the look of the sideshow game, or as a stand alone carnival themeing item. 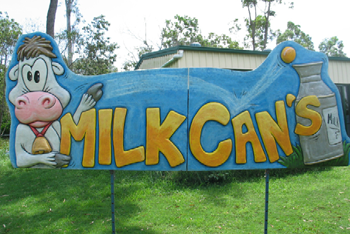 We have three of these signs with different themes: Laughing Clowns, Milk Cans and Bucket Ball. 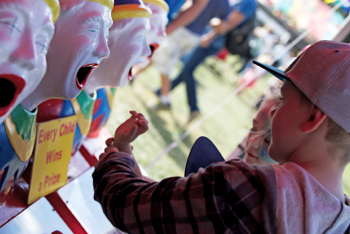 This versatile sideshow alley game adds height and colour to any event, and is of course great fun! Test your skills throwing, tossing, chucking the ball. Should you have made the big leagues? Do you have the balance? 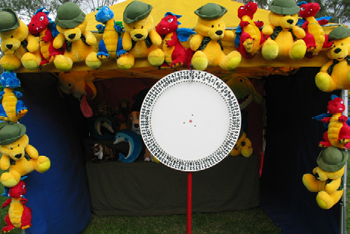 Test your batting skills along with your hand-eye coordination. Do you have the talent to get the ball through a hole?! 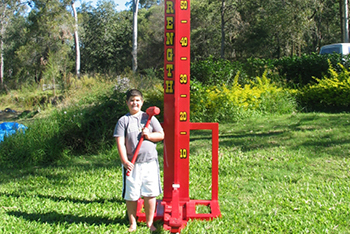 "Test your strength" on another carnival favourite. Hit the base with a hammer, if you have the strength you will fire the slider to the top to ring the bell…… “BING”, WE HAVE A WINNER! "Test your skill rather than your strength". It’s a similar feel to the Hi Striker, only to win you don’t have to be a gorilla. Hit the base with a small sledge hammer, you need the skill to make the slider stop at the winning position rather than hitting the top. Ideal for trade shows and give away promotions as the prize levels are changeable. The Zombies are attacking on mass and you are the only one who can stop them! Using a NERF machine gun, you must obliterate as many Zombies as possible with the limited ammo you have. Go it alone, or team up with the human beside you to strategise your attempt at the next wave coming your way. The higher the number of “confirmed kills”, the better the prize! Poker has become a worldwide phenomenon. 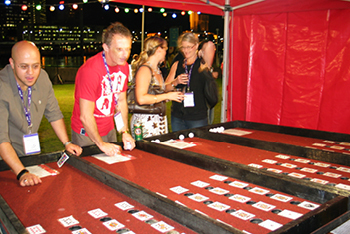 This is our latest game, and rapidly becoming a corporate event favourite. 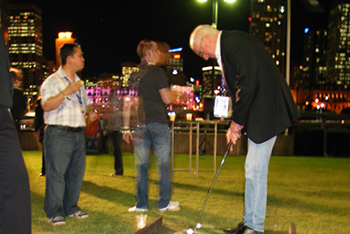 Players play against each other to win the prize by rolling a golf ball into the holes to discover the allotted card value. The player with the best card hand (by the rules of poker), wins the prize. An oldie but a goodie! 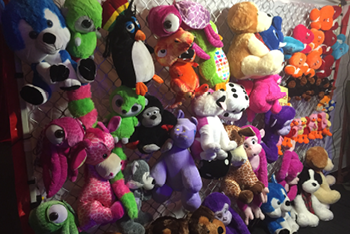 Toss enough balls into the can and win a prize! This is always a popular game; let’s face it, how many people like to play golf? Players play by putting down the 5 metre green. Watch the bunkers, and the rough, put it into the hole to win the prize! Tiger Woods would find it a challenge! A favourite for all ages, everyone loves watching the colourful ducks swimming round the pond. A fishing rod is used by each player to pluck their duck from the pond. 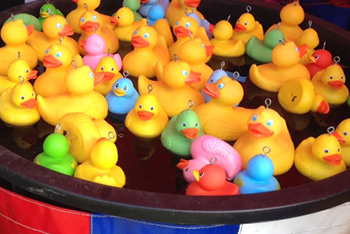 Under each duck is a number which corresponds to the prize. An old-time favourite! 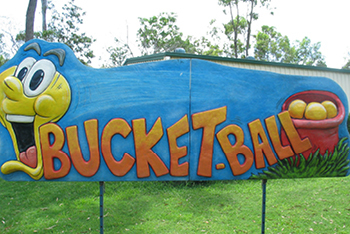 Knock down all the cans by throwing the two balls to win the prize. A very competitive game of skill. You need a bit of height for this one as it is the real deal. Show us your skills from the free throw line. 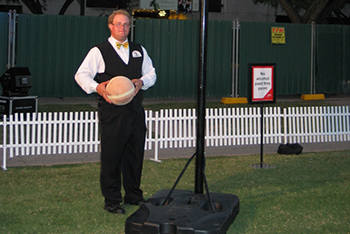 Get the basketball into the NBA approved hoop to win a prize. Three shots is all you get, the more you sink the better the prize! Little bit tight for room height? This one is the one for you. Two hoops, three attempts, the more you get through the better the prize. Miss the basket and it is all over. A very colourful array of balloons adorns the board. Toss the dart and win the allotted prize which hides behind the balloon. 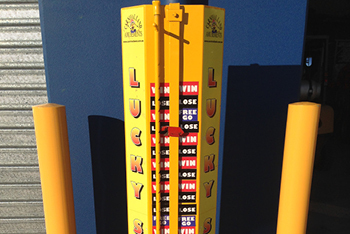 Do you have the balance it takes to climb to the top and win the prize? Test your skills on our latest game. 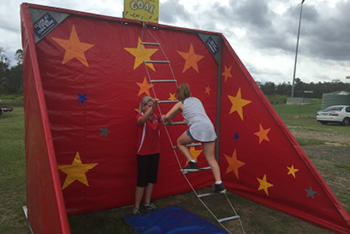 Climb the swivelling steel rope ladder to the top of the frame and grab the prize. It's that easy..... Or is it? Great for team building days and corporate events. With numbers 1 to 100, this wheel is ideal for meat trays, raffles, lucky number competitions and so on. Supplied with an operator or simply hire the Chocolate Wheel and run it yourself. This is a very popular corporate game. It looks simple, however it takes a great deal of skill. Use the rod with a rope and a loop to try and make the bottle stand up from a lying down position. You think it is impossible until someone gets it. Then the competitive spirit really raises its head. Everybody has a camera on their phone! What a sensational atmosphere addition to have this old school entertainment of putting your head through the board and taking a photo. Next week it will be your screen saver! Cool. We have three double themed boards: Lion and Tamer & Two Clowns; Muscle Man and Skinny Guy & Indian and Sheriff; Mickey and Minnie Mouse & Tarzan and Jane. 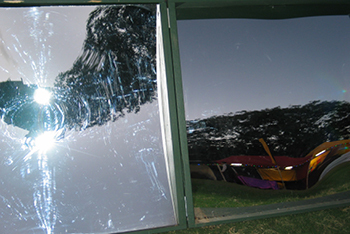 What a laugh, we all remember them, looking in the warped mirror to see ourselves skinny, fat, big head, elongated arms. It’s almost as funny watching the people in front of the mirror contorting themselves. This compact barrel can be used to collect business cards for a competition or used to put raffle tickets in for the big draw. Supply your own merchandise or we can help provide you with a suitable array of toys tailored to your needs. Please note, the toys shown are examples only. The varieties change continually depending on what is popular, the latest movies and video games, or just what is the latest trend!! 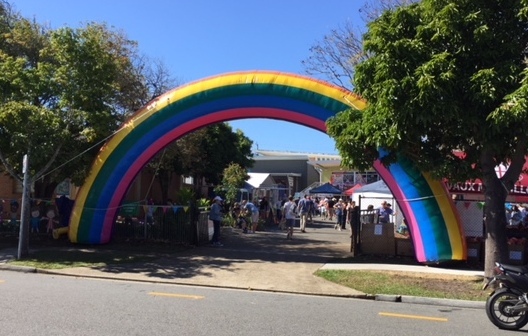 Why not create a colourful WOW factor to your entrance? Make an impact before people have even walked through the gates! ..... or just make it an extra somewhere else for the overall carnival feel. Round Up , Paratrooper, Giant Ferris Wheel, Cobra, Music Trip, Whizzer, Avalanche, Octopus, Lets Dance, and many more.